Welcome Summoners to the League of Legends University Series! 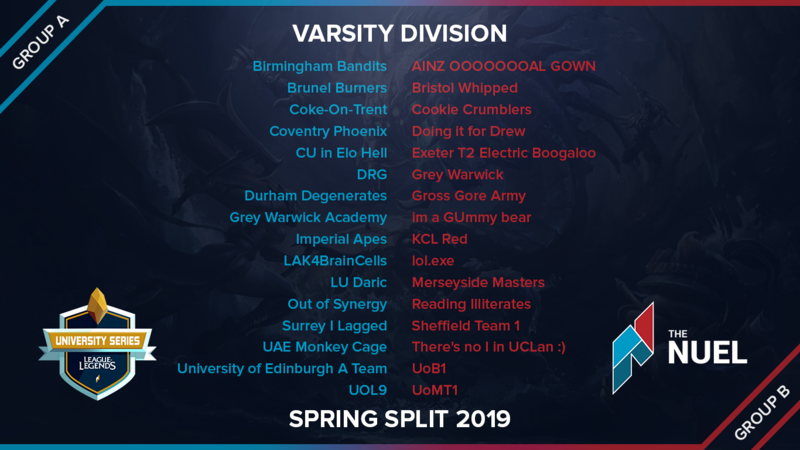 Teams from all over the UK will compete for a chance to represent their University on the International Stage in addition to hordes of prizes from exclusive LCS trips to piles of RP. Start collecting your fellow students into teams now and battle it out on the rift. Multiple teams from the same university are encouraged and we always find opponents of a similar skill level to you. The best 32 University teams from Winter will come together in their own unique division to prove who is the best. The winners will receive a professional bootcamp with pro’s and the chance to represent their university on the international stage in the University Esports Masters. The top team will also win an exclusive League of Legends VIP trip to Berlin, as well as being tons more Varsity prizes to be announced. Team registration does not close once the tournament starts, and your free to join throughout the season.Teams can add new players and edit their roster throughout the tournament. There will be a Check in system released during the tournament, you must check you team in on Sunday before 6pm. If a team does not check in by 6pm they will not be seeded into that evening’s fixtures. Captains must be the player representing the team on tournament night. Results must be submitted by both captains via the companion before starting their next game. Failure of either of these may result in penalties. We expect teams to remain sporting at all times, In the event of any flame or other poor sportsmanship please take screenshots and submit to admins. Teams are expected to arrive promptly to all games. If a team does not have all 5 players ready to play 20mins after the scheduled start time they will forfeit the game, (or 20 mins after both teams have finished the previous round match). Rosters will be locked after the Check-in deadline. After roster lock, teams can make one emergency sub, which must be done 1 hour prior to any matches they wish to take part in. If you are unsure of any rules contact an admin. You can find the full rule set here. The top sixteen (16) teams from both regions in winter qualify for the Varsity Division in spring. Two groups based on qualifying seed will play in a round robin format before entering a single elimination playoffs. Log in to your account to create or join a team.